The Dell PowerEdge R920 rackmount server offers high performance and hyper-scalablity designed to boost business-application effectiveness, efficiently consolidate workloads with large-scale virtualization, and deliver exceptional database performance. The R920 boasts impressive expandability with an enormous memory footprint (96 DIMM slots for up to 6TBs! ), up to 24 internal drives, and up to 10 PCIe Gen3 and Gen2 slots. This flexible infrastructure permits large enterprise SAN environments, and makes this system a perfect choice for performance sensitive centralized business applications such as customer relationship management (CRM), enterprise resource planning (ERP), or even consolidating these applications using large scale virtualization. Aventis Systems carries the Dell R920 with four 2.5" hard drive bays, sixteen 2.5" hard drive bays, or twenty-four 2.5" hard drive bays. For mission critical environments where expandability, reliability, and performance are priority, please browse our PowerEdge R920 systems below. Click customize for your built-to-order configuration! 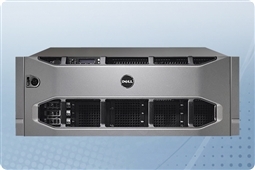 Aventis Systems carries the Dell PowerEdge R920 in both Aventis Certified Reconditioned as well as New condition. All servers from Aventis System include a 3 year Comprehensive Warranty, with eligibility for optional Express warranties and onsite services. 4TB (4 x 1TB) 7.2K 6Gb/s SATA 2.5"
1TB (4 x 256GB) SSD 6Gb/s SATA 2.5"
584GB (4 x 146GB) 10K 6Gb/s SAS 2.5"
1.2TB (4 x 300GB) 10K 6Gb/s SAS 2.5"
2.4TB (4 x 600GB) 10K 6Gb/s SAS 2.5"